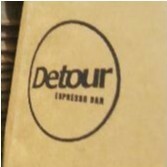 Detour Espresso Bar joined our Mission to help provide access to “Clean Water for All by 2030”. This Mission was initiated by the United Nations. A big thank you to Detour Espresso Bar’s team and customers for joining this extremely important mission on 13 February 2018. "My favourite caffeine dealers near my office, the coffee here stands above pretty much all the other espresso in the neighbourhood and they are wonderful easy going about things, get to know your name and your order, etc."